Growing up, I don’t remember disliking my hair. I recall hating the washday process (i.e., getting my hair washed in the sink, tangles, and the hot comb), but all in all I didn’t have any negative thoughts. Then, one faithful day after turning ten years old, I was granted the rite of passage – a relaxer. I looked at my glossy straight hair afterwards, and thought, “How did I ever love my hair before this?” From that day on, I cringed at the sight of fuzzy edges or the appearance of any curl that might resemble my natural texture. Before relaxers I’d never really thought about my hair as a primary component of “My Look”. All it took was a few comments of admiration, and references to the shine and sleekness – I was hooked. Relaxers were obviously the way to go. Fast-forward through high school, my undergraduate studies, and even my MBA, and my hair chronicles consist of a blur of precisely timed relaxers and eventually weaves. I no longer felt my own hair was enough, now I needed more volume and more length. As you might imagine, all of this experimenting took a toll on my hair. One day I looked in the mirror and saw limp, dull, broken tresses that I wasn’t proud to call my own. Yet, instead of researching how restore my hair, I turned to gluing and sewing in weaves, which resulted in further damage. Eventually I had to cut my hair into a short bob in order to look presentable. I started seeing the natural hair trend becoming more popular, but I was still too accustomed to my limp, straight mess on my head. I admired the natural look, but I didn’t think I could pull it off. Besides, I tried to start my natural journey three times and chickened out rather quickly. Then in January 2011, my husband and I found out we were expecting. In May of that same year, I was excited and nervous to find out we’d be welcoming a baby girl. I was excited for all the obvious reasons, but my nervous feelings stemmed from one overarching place – my hair. Clearly I didn’t know how to care for my hair. How was I going to maintain two heads of hair when I’d already lost the battle with my own? I knew I didn’t want my daughter to develop adverse feeling about her hair, but how could I model something that I didn’t possess? I wish I could say that I immediately began the journey of changing my mindset and learning to care for and love my hair, but that would be a lie. 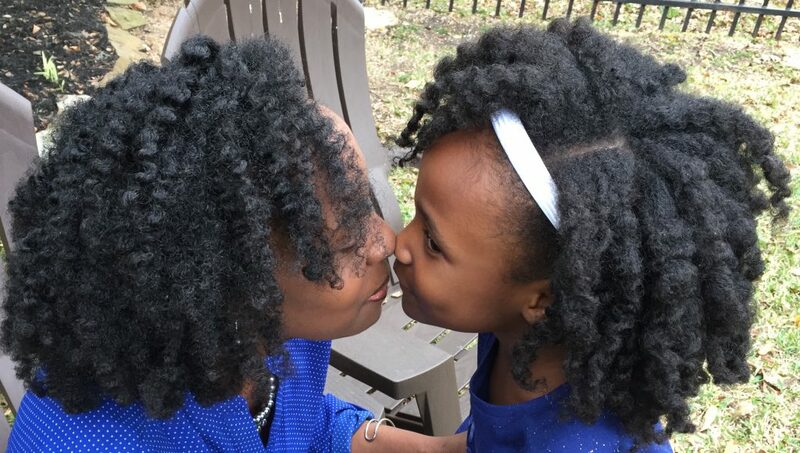 In actuality, my daughter was approaching her second birthday and I was in the first year of my doctoral program before I finally said, “Enough is enough!” My daughter’s hair was growing well, but I was having trouble finding ways to help her retain moisture. As for my own hair, I had resigned myself to half wigs and drawstring ponytails to hide the dry, brittle mess I was working with. July 2013, I stood in the bathroom and cried as I looked at my hair for the millionth time, and realized I was failing myself and soon I’d fail my daughter. Would she be standing in her mirror with the same tears in her eyes one day? Not if I had anything to do about it. So, I began researching healthy hair tips and guidelines and came across a natural hair community that I never knew existed. My search began strictly for my daughter’s benefit. I had given up on my own hair, but I was determined to give her a better experience. I found expert advice from Curly Nikki and The Science of Black Hair, and YouTubers like Jenell Stewart (Blakizbeautyful) and Whitney (Naptural85). 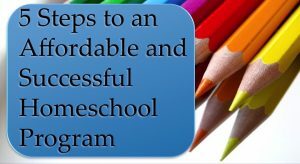 I devoured the information found in articles and videos, and by September 2013 I had created a regimen that I planned to use for my daughter. However, I didn’t want to start using products on my baby girl’s hair without testing them, so I decided to be my own guinea pig. I decided to test my regimen on my own hair for one month before trying it on my daughter. I’ll never forget the day I looked at my hair after four weeks had ended. I couldn’t believe the softness of my hair, the thickness of my new growth, and the level of moisture. I was ecstatic that I’d identified a way to care for my daughter’s hair, but I was overwhelmed with joy at realizing it wasn’t too late for my own hair. 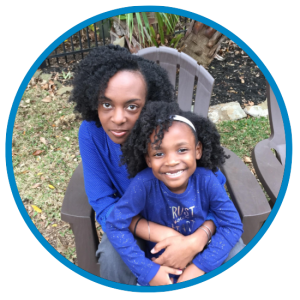 I was empowered to create a new reality for my daughter and I. I was determined to teach her to love her hair, and as a result, I rekindled a love for my own. Today, I absolutely adore my hair – including the shrinkage. I have my daughter to thank for this love affair that reached three years in September 2016. When I rocked my natural hair as I walked across the stage at my doctoral graduation, I knew I’d come full circle! My desire to not fail my daughter gave me the push I needed to not fail myself. What’s even more thrilling is the fact that I get the opportunity to witness my daughter’s confidence in her natural hair, and I know that I am guiding her in the right direction. How glorious it is to hear my daughter say that she loves her hair just the way it is. I have to beg her to let me put in a bow or headband because she just wants to see her curls without anything extra. As she thrives, I am emboldened as well. When did you begin to love your hair? What experience helped you achieve that realization?